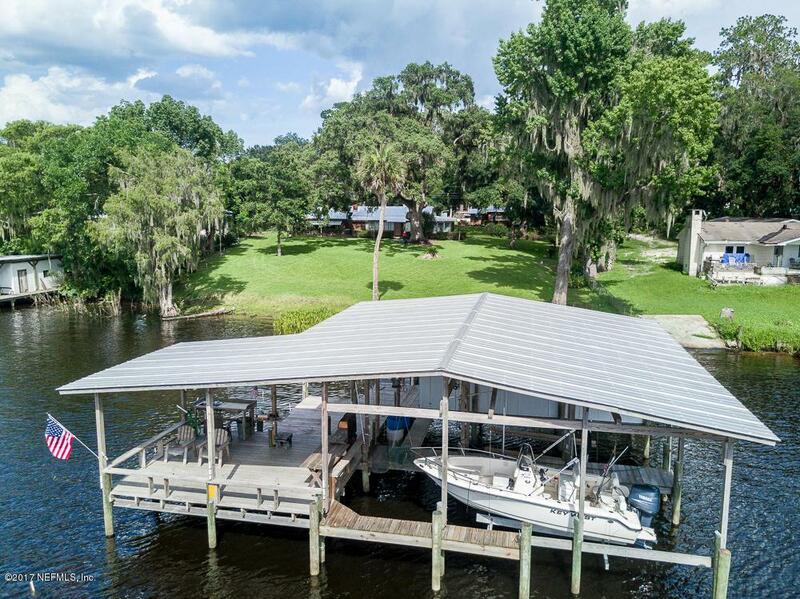 This outstanding high and dry 3.9 AC Riverfront property which had no problems during Hurricane Irma,has something for everyone! There is a 2400 sq. ft. shingle style main house, a 1235 sq.ft. shingle style guest house (both with metal roofs) a large barn or garage and a smaller pole barn with a storage house. The dock is AMAZING with two covered slips, enclosed storage (you never find that!) a slip for a trawler, and lots of platform area to hang out! The yard is quite high and flooding will not be an issue here. There are flower gardens, a rose garden and room to grow whatever you want. There are even enclosures for hens so you have fresh eggs, too. This is a terrific opportunity for a family riverfront property. The views are inspiring as are the sunsets!Please note that both boat lifts are 4,000 lbs each.